The USS Triumph is labelled with the rather contradictory class description of "Light Dreadnought." The large primary hull is embedded in an engineering hull that is nearly vestigial in comparison to a full-sized Federation class dreadnought. The attempt to compact the size while maintaining armament and power resulted in overall length reduction, but no savings in draft or beam, and satisfied no one. Nevertheless several were built to supplement the fleet in times of Klingon unrest. Above: This image was recorded when an Orion pirate base was discovered on a small moon in the Corridan system, a further vioation of their probation after the Babel Incident. Personnel from USS Hood subdued and captured the pirates on the ground while Triumph destroyed the limited orbital defenses. 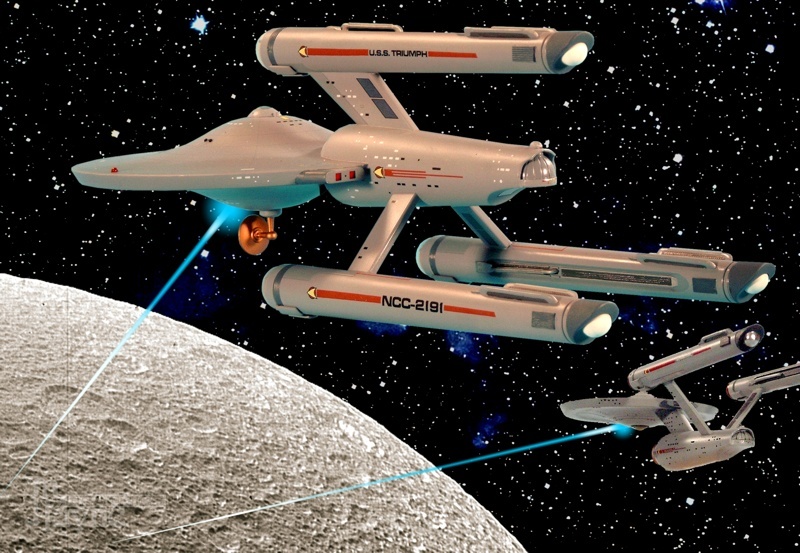 Then both starships joined together to destroy the evacuated base with phaser bombardment. 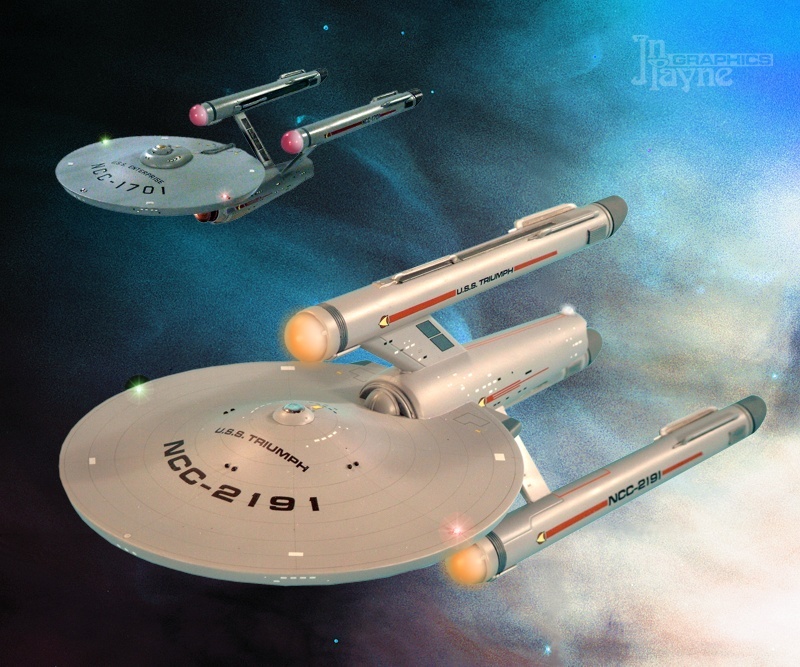 Right: A study in contrast - Triumph's awkward design does not compare favorabley to the graceful lines of USS Enterprise, as they rendezvous in deep space. 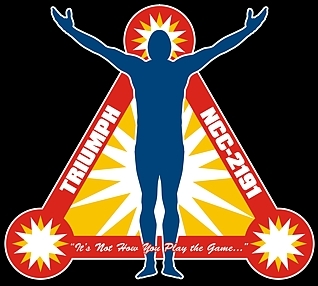 Asthetics aside, one thing Triumph does do well is fight. 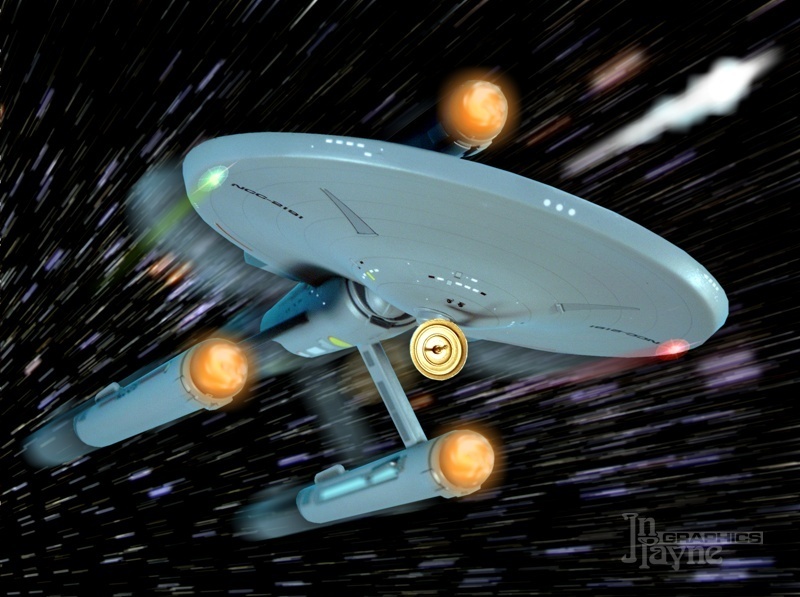 Seen here in a flank-speed pursuit of a Klingon battlecruiser that violated the Neutral Zone, Triumph unleashes a warning photon torpedo barrage across its bow while barreling through subspace at warp factor 9.